1. Preheat the grill to high. Meanwhile, melt 10g butter in a small pan over a medium heat and add the leek. Cook gently for 5 minutes until softened. Remove from the pan and set aside. 2. Melt 20g of the remaining butter in the same pan and add the flour. Cook for 1 minute, then gradually stir in the milk, cooking for 1–2 minutes further over a low heat until a thick sauce forms. Season. 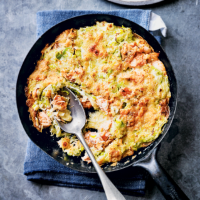 Stir in the leek and the flaked salmon. 3. Whisk the eggs in a bowl. Season. Heat the remaining butter in a 20cm omelette pan, or small frying pan. Add the eggs, then lift with a fork in the centre to let the runny egg down onto the base to cook. Cook the omelette until the base is golden and the top is just set. 4. Spoon the leek and salmon mixture over the top, and gently spread level. Scatter with the Parmigiano and grill for 2-3 minutes until the top is puffy and golden brown. Cut into wedges and scatter with chives. Serve with a green salad.